Do you remember your first canter? I started riding when I was two. 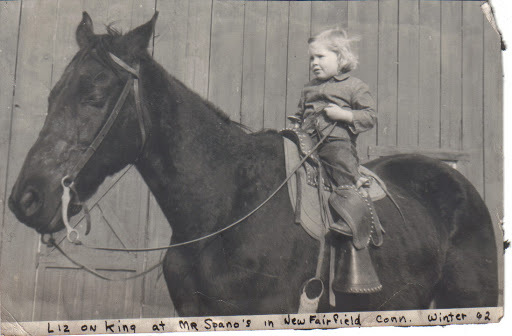 I can still remember riding King at Mr. Spano’s barn. My father used to take me riding on the weekends. I didn’t canter until I was at least 6. Recently I had the pleasure of watching a seven-year old girl ride her first steps of canter. Even better, I was able to grab some video of it. She did a great job and boy was she proud of herself. Watching her canter made me remember the first time I cantered. I was probably about six and it was at the riding ring of the Timber Trails Club, which used to be a fixture in Sherman, Conn. I’d been in the summer riding program — which involved riding from the barn through the trails, through the shallow water of a pond and over to the ring. Trotting was going well; cantering terrified me. I must have driven the instructors crazy by insisting that I wasn’t ready. Finally, my horse took a few canter strides. It was heaven! Instantly I regretted all my delaying tactics. I was hooked and so, I think, was Dana. I love that horse. She is SO good with the kids!